Home / Family & Lifestyle / Parenting – Am I doing it right? During our visit, my other half happened to mention that we rock baby to sleep before putting her in her cot. The family were shocked at this, saying we should be putting her in her cot and leaving her to self settle and fall asleep of her own accord. Finding myself getting defensive and feeling like my parenting skills were being questioned, I stated that we’d tried that and that she just hurts herself by rolling into the side of the cot and banging her head over and over again. Bumpers were then suggested and I advised I don’t like them due to the risk of suffocation. Before we were leaving for the hour long journey back, we were asked if we were going to put her in her pyjamas. I hadn’t even contemplated bringing her pyjamas with us and I felt bad for not thinking about making her as comfortable as possible during the journey home. I continued to question whether we were parenting wrong over the next few days, so a couple of nights later I decided to put her in her cot while she was awake to see if she would fall asleep on her own. She didn’t. Nor did she show any signs that that’s what she was even contemplating going to sleep. Instead, she opted to roll onto her front and practice her crawling technique, bashing her head several times in the process, because what better time to try to crawl when you’re snug in a sleeping bag in your cot? Surely, this was all the evidence I needed that leaving her to her own devices in her cot was doing her more harm than good? I’m still not 100% sure of my abilities, but is any parent? 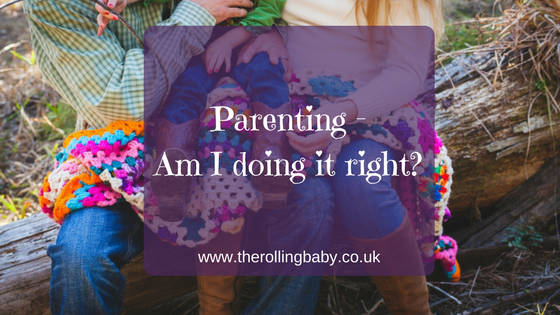 Don’t we all have wobbly moments when we question whether we’re doing it right? What I do know, though, is that wherever I go, someone somewhere has got an opinion on the way me and my partner should be bringing up our baby. Whilst we appreciate their help and them sharing their experiences, we’ve been doing things ‘our way’ so far and using our gut instinct and so far everything seems to be going well. She’s rolling, she’s attempting to crawl, she’s found her voice and she’s taken to weaning very well, so surely my partner and I are doing something right? Should Parents Worry About Baby Formula? Do You Regret Your Choice Of Baby Name? Is Limescale Something To Worry About With A Baby? Are Aldi’s Baby Products Any Good?